Travel Gear – get your suitcase ready for a holiday! It is the start of long holiday season and typically the time when Indian families set out for a holiday. However travelling can be made comfortable by having the right kind of apparel. Yes you read that right. Here are some handy aspects that can be kept in mind for your next trip. Chumbak has recently launched it’s SS ’17 collection, Tropical State of Mind. True to Chumbak’s style, this summer collection features designs of tropical leaves, pineapples, flamingos and toucans; play on architecture and other prints that are Chumbak’s rendition of the elements representative of the tropics. These designs have lavishly been used across clothing that can also be worn for travel – sculpted printed leggings, casual tees and tops, flowy skirts, and fun, summer friendly dresses. Material exploration for comfort has also been explored with this collection. The collection comprises of cotton, viscose, modal, and other lighter materials to enable an effortless wear. “amanté’s active wear range is ideal for travelling comfortably. 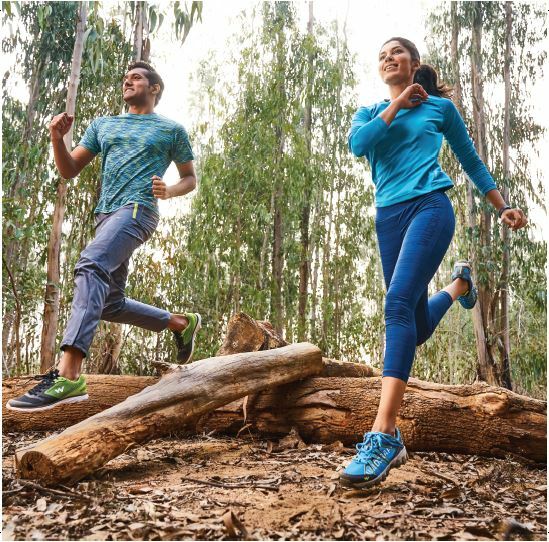 Perfect for a long hike or a walk along the meadows, this collection features stylish varieties of sports bras, camisoles, tank tops, capri pants and shorts,” says Smita Murarka, Marketing Head, amanté. “We are constantly trying to add new products to our collections. We currently have a range of protective jackets, urban jackets, denims, t-shirts and helmets. We had collaborated in this effort with Louis Leathers to create certain jackets. Also, from our own brand, we keep adding new products month on month to the existing portfolio. We create collections that inspired by our own experiences; we have an in-house rides and communities team and the UK Tech Centre with whom we are always seeking some inspiration basis their travels and new product developments,” says a spokesperson from Royal Enfield. Travel apparel is all about being comfortable on long journeys. The industry is seeing a few more performance based launches than in the past which is a sign of growing interest in this as a separate category within apparel. Wildcraft has recently launched an ergonomically designed range that maps the human body and provides ventilation and breathability at critical points. There are traveler shirts with vents at the back and UV protection coating. The convertible pants can be unzipped at the knees to be worn as shorts and they are also packable which makes them a great space saver when you need that extra space in your luggage. 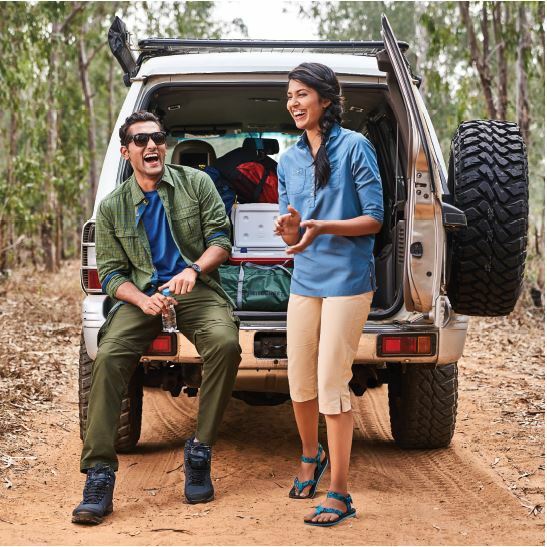 Comfortable silhouettes, materials that are skin friendly and flexible are the hallmark of travel and adventure gear. After all it is important that your clothes aid in making the travel and/or adventure enjoyable. Comfort and ease of movement are the backbone of adventure travel. Clothes which are easy to wear and get out of, and are breathable are important. “Our fabrics are made from the innovation centers of MAS Holdings, which is the parent co of amanté, and a world leader in the world of lingerie design and manufacturing,” says Murarka. Consumers nowadays are becoming quite particular when it comes to travel and adventure clothing. Therefore, the clothing needs to have distinct elements of functionality and safety while keeping the ideals of comfort intact. The vast portfolio of Royal Enfield Gear includes waterproof jackets with multi-usage pockets and quick-drying shirts, t-shirts and head buffs which fulfil the functional elements of travel clothing. The three layer construction of jackets with in-built protection fulfils the safety elements of travel clothing. The option of detachable thermal liners and protection armours ensures comfort to a rider in all weather conditions. The prevalence of different travelling options like motorcycling and car expeditions has encouraged various new trends in Adventure and Travel clothing. One such new trend is of motorcycling gear which amalgamates style, safety and comfort. Today, motorcycle explorers are looking for a distinctive travel clothing experience that is functional, provides safety against abrasion and impact damages, and yet retains the essence of style and comfort. “Royal Enfield Gear is a perfect choice for motorcycle expeditions. Our wide portfolio of products under; Protective, Urban and Essential Gear categories enable the consumers to experience the thrill of pure motorcycling,” says a spokesperson from Royal Enfield. Shubhra Chadda, Co-Founder, Chumbak adds, “the new trends that we see and are creating for travel clothing are bright and loud prints that can easily be styled with solids, oversized clothing, boxy fits, sneakers / closed shoes, oversized totes.” Making clothing as functional as possible, without losing the aesthetic, is the focus of travel clothing. 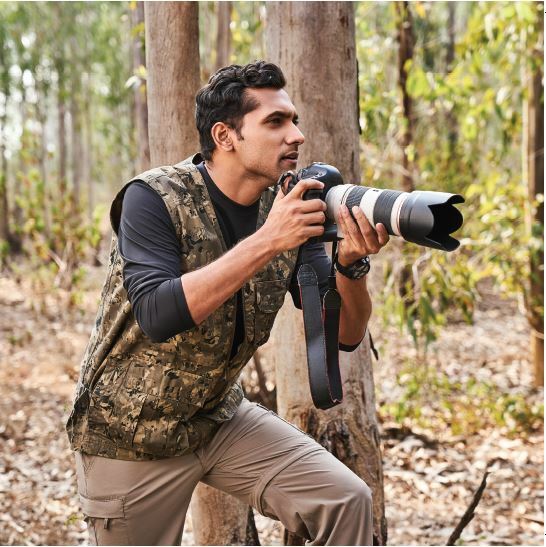 “Safari inspired colours, multiple pockets and ventilation make this category stand out from regular fashion wear. Fabrics are chosen to make sweat wicking easier – in some cases this may be cotton – but there are also polyester and nylon blends coming in to the market that are more functional in hot weather. 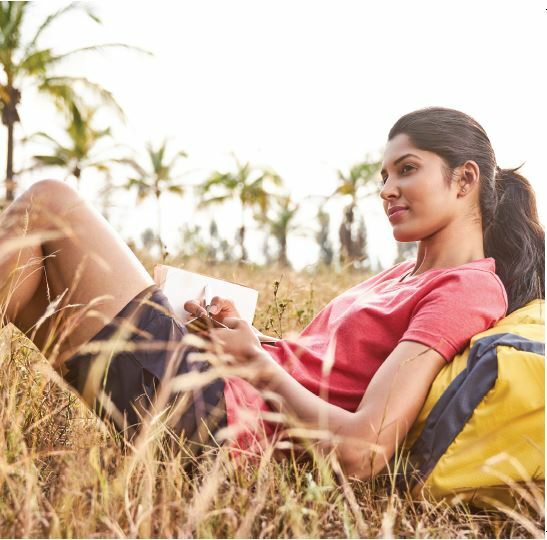 A variety of coatings and treatments are used to provide UV protection, water repellence and other added benefits,” says Surabhi Talwar, Head of Marketing Communication, Wildcraft India Pvt. Ltd. If you are the kind however that is not sure what to buy or are short on time before travelling, there is a great option – simply rent your travel gear! Shubham Jain, CEO, GrabOnRent that caters to the ‘hip’ generation, Generation Y, echo boomers, net generation, in most common terms The Millennials says that this is a trend that is catching up. “Millennials form the core of our population today representing nearly 65% of our entire population. One very prominent trend of the millennial generation is a tendency to seek adventure and to never settle as they believe there is always something cooler, something better, something much more valuable to be explored; which partly arises from the need for instant gratification. With a high tendency to seek adventure the inclination towards travelling has been the most fascinating one. Millennials prefer spontaneous last minute trips and even backpacking for a weekend getaway. And, it’s not just the adventure that attracts them to charter such roads but the zeal to explore and connect with people along their journey.” To cater to such an increasing and intriguing trend they decided to offer travel gears on rent, so that those last minute spontaneous plans did not have to be put on hold and the travellers make the most of their travel experiences. “For those who love to hit the roads and lose themselves in the mesmerizing beauty of nature, one could log on to www.grabonrent.com and choose to rent from our wide range of travel gears ranging from rain jackets to sleeping bags, from hiking bags to tents. There is a travel gear for every weather and destination. So experience the true magic of travel and adventure by getting the right outfit. With majority of the customers being young working class individuals who love to travel, we generally experience a high demand during extended weekends and holiday seasons which is an ideal time for anyone looking for a break from their monotonous life,” adds Jain. The market is still at a very nascent stage in India and is growing slowly but steadily. 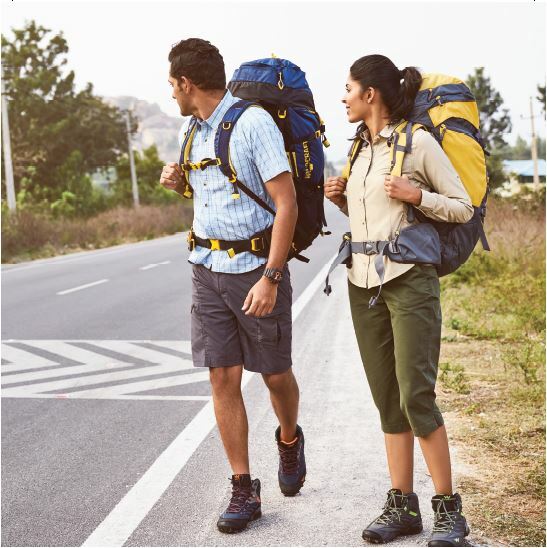 Consumers have started accepting the advantages of investing in travel and adventure clothing yet there is a need to create more awareness. “Summers is usually about the latest collections in fashion wear and this is dominated by bright colours, different cuts and lengths. But we are seeing some traction from consumers who are looking for functional wear now that they are keener on travelling during the holiday season. There are also more brands advertising their spring/summer collections which helps to create a buzz in the market during this season,” says Talwar. Young India however, is becoming more aware of the importance of travel and widening their horizon, and thus this market related to all things travel is on the rise. Having a wardrobe for travel is slowly but surely getting into the consumer psyche which has largely spurred the market. The potential is huge and will travel a top priority among the middle class, there is a market that will surely grow in the days to come.